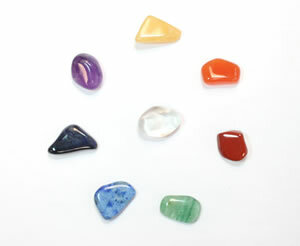 The most economical way to purchase tumbled stones. 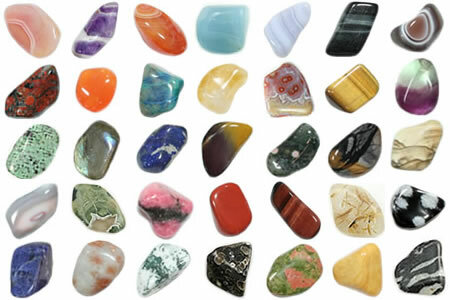 Each package contains many different types of stones in a variety of colors. Tumbled stone mixtures are popular for crafts, planters, vase filler, decor, New Age projects, mementoes, and much more. We sell them by weight in 1, 3, 10, 20 and 40 pound packages. The larger the package the lower the cost per pound. Premium stones for jewelry, decor, crafts and more. 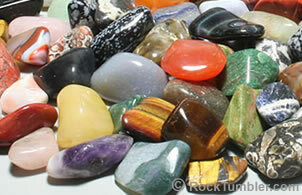 We also sell premium-quality tumbled stones in single-variety packages. These are medium-size stones (approximately 5/8" to 1" in maximum diameter). They are sold in 5-stone, 1/4-pound, 1/2-pound, and 1-pound packages. The larger the package the lower your cost per stone. Single-variety polished stone packages are a great way to get beautiful stones that are a bit nicer than the stones included in our mixtures. They are purchased by people who use the stones for jewelry; New Age practices; game pieces; home and office decor projects; artwork; teaching; photography props; retail displays; potted plant accents; rock, mineral and gem collections; and much more. Tumbled stones (also known as "polished stones" or "baroque gems" or "polished rocks") are small pieces of rocks and minerals that have been rounded, smoothed, and polished in a rock tumbler. They are beautiful, colorful, brightly polished specimens of natural materials. These polished stones are very popular with people who make jewelry or use them in a variety of craft and home decor projects. They are also used in many New Age practices. We sell them in mixed stone packages and in single-variety packages. 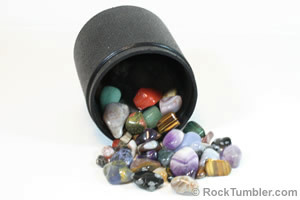 We also have a page that shows many uses for tumbled stones. Lots of gift shop owners, schools, summer camps, nonprofit organizations and others have contacted us to ask, "Do you sell wholesale?" Our reply is always, "We sell to everyone at the prices listed on our website. The prices there give you a discount for purchasing larger sized packages." That is the reply that we give to everyone. When you purchase a one-pound bag or a three-pound bag of mixed tumbled stones, you pay a higher price per pound than the person who buys a 10 or 20 or 40 pound bulk package. Lots of retailers purchase our bulk packages and resell those stones at profitable prices. 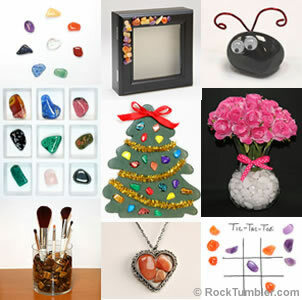 We offer some retailing ideas for shop owners at the bottom of our bulk tumbled stones page. We know that lots of people like to have a small collection of nice stones. To help with that we offer a collection of 40 different tumbled stones from around the world. We also offer small packages that contain five premium stones for over 60 different varieties of tumbled stones. 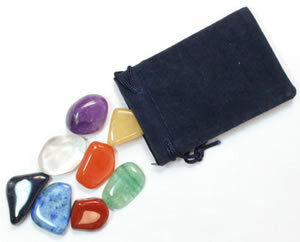 Lots of people like to store a few tumbled stones in a velour "treasure bag" with a drawstring. We sell tumbled stones in five different sizes: extra small (5/16" to 5/8"), small (1/2" to 3/4"), medium (5/8" to 1"), large (7/8" to 1 3/8") and extra large (1 1/8" to 2"). 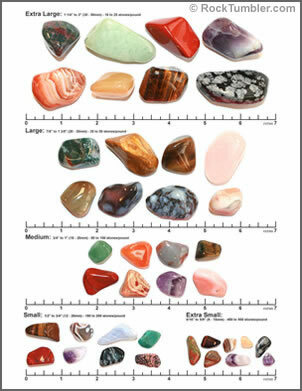 To help you visualize these sizes, we have a tumbled stone size chart that you can download as a .pdf document and print. When printed on paper, the photos of the tumbled stones are as close as we could get to their actual size. If you have any questions about stone sizes and shapes, please print this document. Make Them or Buy Them? 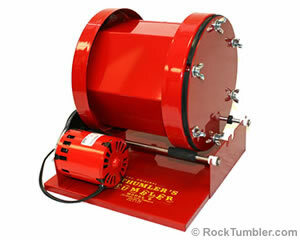 Some people purchase a rock tumbler because they think it will be cheaper to produce tumbled stones themselves than it will be to buy them. This might be true if you live where you can collect great agates or jaspers for free. However, if you have to purchase the rough, purchase grit, purchase polish, pay for electricity and spend lots of time, then you are probably better off buying tumbled stones. It is very difficult to compete with commercial rock tumblers who tumble in 6000-pound tumblers and purchase their supplies by the ton. 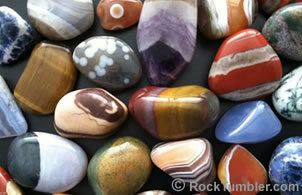 We have an article about the economics of producing tumbled stones. In summary, buy a rock tumbler if you want the experience and satisfaction of tumbling your own stones, but if you want to save money on tumbled stones then buy tumbled stones in bulk. 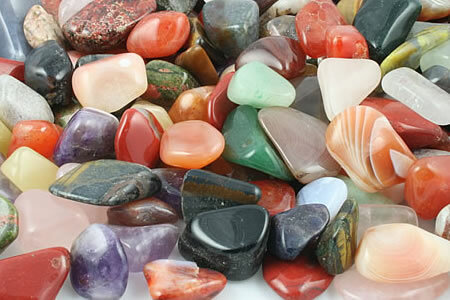 Tumbled stones are produced from hundreds of different types of rocks, minerals, volcanic glasses, and fossil materials. The most commonly seen varieties include agate, jasper, petrified wood, and varieties of quartz such as aventurine, tiger's-eye, and banded amethyst. 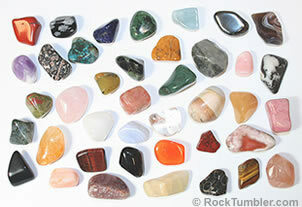 We sell tumbled stone mixtures and over 60 varieties of tumbled stones. These are perfect gifts for people who love tumbled stones.... 1) a crystal-clear jar full of beautiful tumbled stones; or, 2) a white drawstring bag that contains a pound of tumbled stones. 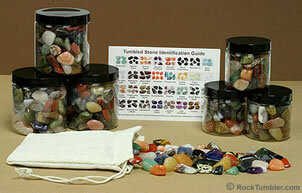 A free tumbled stone identification guide is included with each bag or jar. 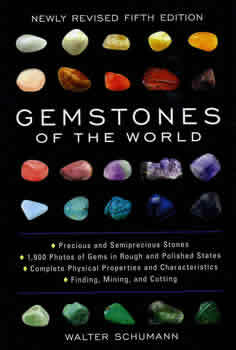 Gemstones of the World by Walter Schumann is one of the most popular gemstone books ever written, with over one million copies in print. The fifth edition has about 100 pages of basic gemstone information and about 200 pages dedicated to photos and descriptions of over 100 gems and gem materials. It will help you learn about gemstones and serve as a guide to their identification. This book is always kept within easy reach at the desks where we do our reading and writing because it is an excellent book for learning and reference. Get a collection of 40 different semiprecious tumbled stones from countries around the world and five different continents. Each specimen is a brightly-polished example that is representative of that gemstone. Specimens range from 5/8" to 1" in maximum diameter. These are great to keep as a collection or for use in making jewelry and craft projects. 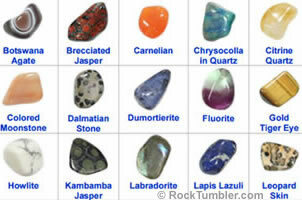 The most popular types of tumbled stones are made from materials that are fairly easy to identify. If you have some tumbled stones, a comparison chart, and are willing to do a little learning, then you should be able to identify many of the stones. See our picture guide to polished stone identification, and our printable tumbled stone identification chart. 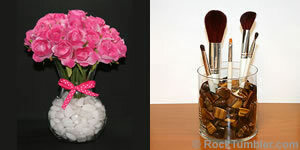 One of our favorite uses of tumbled stones is in vases or planters or any clear container. Place a few medium or small tumbled stones in the bottom of a vase, insert your flowers and then add enough additional stones to hold them in place, or fill a clear vase to a height that looks nice. Get a nice clear container, add some medium tumbled stones and insert your cosmetic brushes to create a colorful brush holder. A couple large polished stones make a nice accent in a potted plant or add a ground cover of small polished stones so that you don't disturb the soil when you water the plant. The cover of stones also slows evaporation. Enjoy! Many people believe that placing certain types of rocks, minerals, or gemstones on parts of the body that are suffering can produce a healing effect. This and many other practices have been followed by many cultures, in all parts of the world, throughout recorded history. Although there is no scientific evidence to support these practices beyond a "placebo effect," many people today continue to seek out certain types of tumbled stones for their healing, energy, mental, romantic, spiritual, or other potential values. We make no claims whatsoever that the stones that we sell have any special values or powers. Medical experts always recommend seeking qualified medical assistance if you have any physical or mental concerns. A delay in seeking proper treatment can result in serious illness, injury, or even death. Please take care. Tumbled stone jewelry is easy to make. All you need are some findings, some glue, and a small pair of pliers. We sell jewelry parts collections that allow you to make pendants, keychains, tie-tacks, and bracelets. 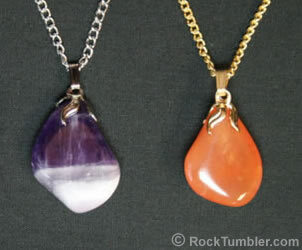 We also have an article that shares our experience in gluing tumbled stones to metal findings.